2014 was undeniably the most violent year for people and organizations that promote human rights. The wave of violence against them has been increasing since 2013 when opposition to the genocide trial coalesced in an alliance between government actors (including the President’s office), business interests from the agriculture and extractive industries, groups of former members of the military involved in human rights violations, and right-wing extremists. This alliance was strengthened through a series of “pacts of impunity” which included strategies to criminalize public protest and limit freedom of expression. 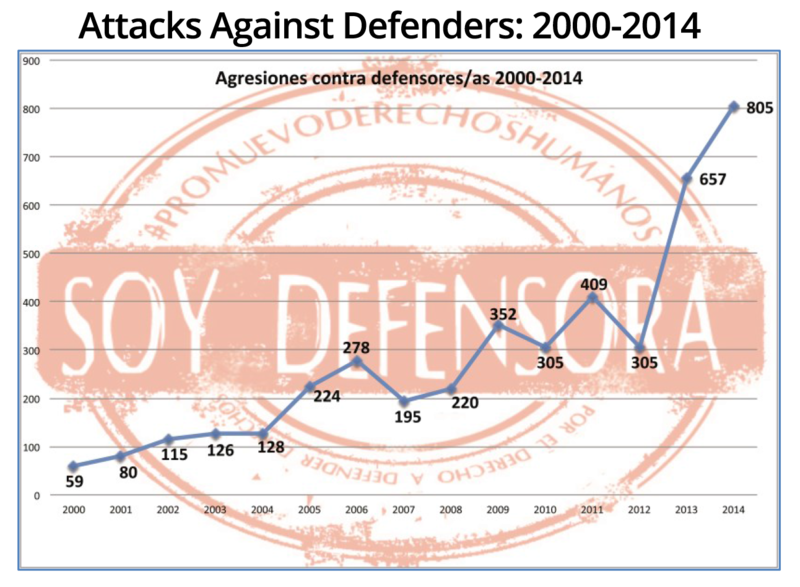 The previous graph eloquently shows the gravity of the situation faced by human rights defenders. During 2014, the human rights community experienced an average of 2.2 attacks per day. Attacks came in all forms; however, acts of criminalization and defamation directly affected the human rights community’s freedom of expression, opinion, and right to organize. Among those affected by these acts were community journalists, human rights experts and representatives of the international community — causing generalized fear in the human rights community. Another important factor to consider is that, though there was a steep decline in threats against human rights defenders, there was a proportionate rise in direct attacks on defenders and their property; as well as acts of intimidation and harassment by state and private security agents. 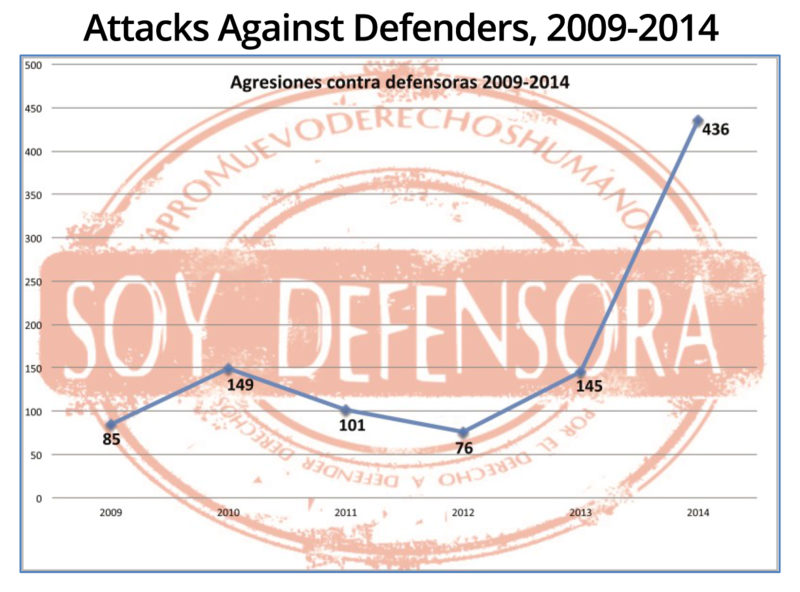 Therefore, in 2014, we saw a sharp rise in physical attacks against defenders instead of simple threats to carry out such actions. We’ve seen criminalization reflected this year not only in trumped-up legal charges but also in the arbitrary detention of human rights defenders as a form of political persecution. Once a person is ‘in the system’, unfounded accusations are launched as a way of perpetrating his/her detention. Another alarming fact is that many defenders report having experienced abuse at the time of an illegal or arbitrary detention, as well as up the time they first appear before a judge. Unfortunately, judges have not taken defenders’ allegations about their treatment by members of the security forces into consideration, nor allegations by defenders’ legal counsel about the irregularities of their detention. 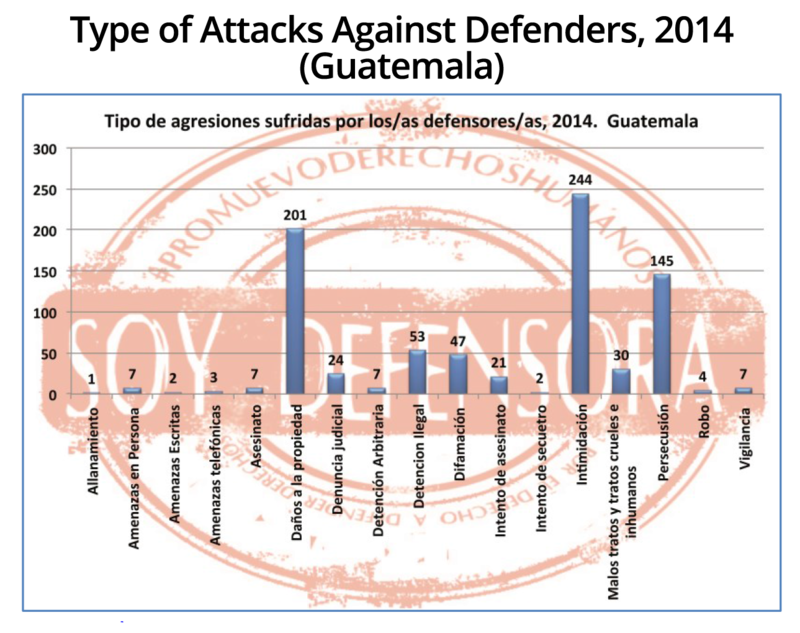 As the previous graph shows, the majority of attacks this year were against activists working to protect the environment and defend their rights to land, territory, and free, prior and informed consent: 664 of the attacks reported were against this group, accounting for 82% of the total. Furthermore, it is important to note that the journalists and media professionals who suffered attacks in 2013 and 2014 are precisely those who cover human rights issues, including attacks against defenders, and global issues related to the search for truth and justice. This year, the violence against defenders was concentrated in the department of Alta Verapaz, and specifically against communities demanding respect for their land rights and those demanding a consultation process prior to the construction of a hydroelectric dam. At the same time, violence continued in relation to the Non-violent Resistance of La Puya and the resistance movement in Ixquixix in San Mateo Ixtatán. 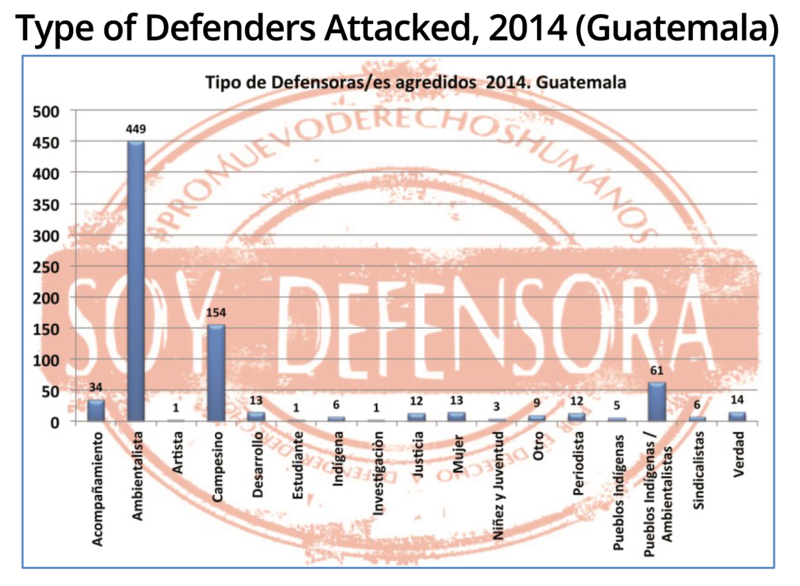 The conflict generated by the Guatemalan government’s lack of compliance with human rights obligations, in particular its violation of the right, to free, prior and informed consent. Many companies seek community consent by buying off leaders and encouraging community members to resolve conflicts amongst themselves – tactics which divide communities and destroy their social fabric. Conflict increases in the wake of government inaction regarding attacks against defenders; inaction that can lead to violence between members of the community. A particularly egregious case that illustrates the weakness of government institutions is that of “Los Pajoques” in San Juan Sacatepéquez. There, four members of a family that refused to sell its land for the construction of a highway leading to a cement factory were assassinated, resulting in a violent reaction from neighbors. The violence led to six members of the family accused of the assassination being lynched by others in the community. These events affected those on both sides of the conflict, especially the children. One of the most vulnerable groups this past year was women human rights defenders (WHRDs) who were victim to 54% of overall attacks against defenders — an increase over previous years. Furthermore, the majority of direct attacks were against WHRDs; specifically, women were the primary targets of aggression during police operations against resistance movements. It is also important to note that many of the acts of intimidation perpetrated against WHRDs were acts of sexual harassment and were perpetrated by the police. This type of attack has not been properly addressed by the government. 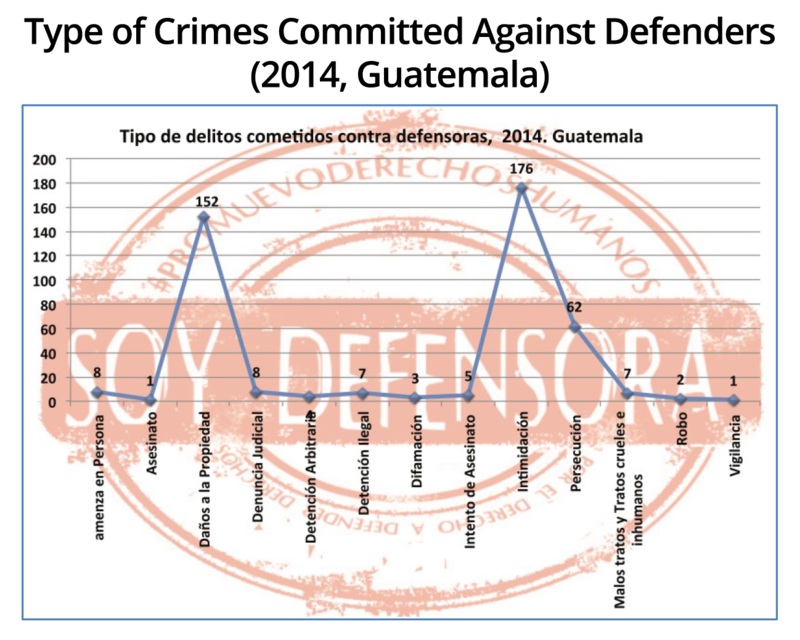 As you can see in the graph above, the majority of attacks against WHRDs were against those defending their rights to land, territory, consultation and the environment. In fact, 60% of the attacks in this category were perpetrated against WHRDs. As violence increases, the state’s response remains insufficient. The lack of effectiveness of the Analysis Unit on Attacks Against Human Rights Defenders is evident in the sheer number of attacks in the last two years. However, there have been some advances in terms of prosecution, especially when it comes to the Investigative Unit on Attacks Against Journalists, which has been able to pinpoint perpetrators from the public sector. Nevertheless, the levels of impunity in such cases remain high. 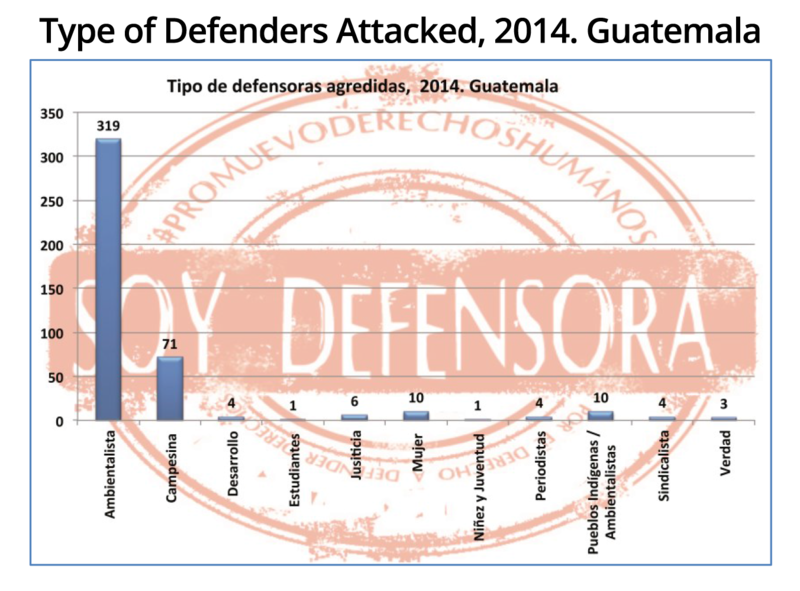 That is why the Inter-American Court of Human Rights, in the case of Florentín Gudiel et al vs. Guatemala, ordered the creation of an institutionalized Protection Program for Human Rights Defenders, which would follow five clear guidelines. If carried out in consultation with defenders, this could become a model for the protection of human rights defenders. This entry was posted in Guest Contributors, Human Rights Analysis, UDEFEGUA and tagged Criminalization, human rights defenders, journalists, land rights, UDEFEGUA by ghrcusa. Bookmark the permalink.